Body of work. That's what was stressed by Jeff Hathaway, chair of the NCAA Selection Committee, yesterday. This is an interesting bracket. The top eight spots are really set in stone, with the only question being who gets the last 1-seed. I currently have Missouri there, but could see it going to Kansas or the Big 10 Champ as well. My guess is that the committee sticks with Missouri and just ignores the result of the Big 10 title game. They've done it before. Marquette is still on the 3-line and looks safe. Only Florida State is in position to jump up there, and with Michigan still as a buffer between MU and the 4-line, they should stick. Again, it seems that more often than not, the Sunday games don't really make much difference, so I think FSU stays as a 4 and UNC stays as a 1 regardless of the result of that game. The biggest game today is without a doubt St. Bonaventure/Xavier. All of the other teams playing today are safely in and likely have their seeds set. However, the Bonnies are definitely on the outside looking in. If they win, they will steal a bid. Which brings us back to body of work. Looking at the cut-line, there are a number of teams that are hovering there. A case could be made that the last few spots could go to NC State, Miami, Drexel, Mississippi State, Mississippi, Seton Hall, South Florida, Marshall, or Washington. Of the at-large teams, I would give a 99% confidence rating to teams 1-28, which includes everyone through Connecticut. 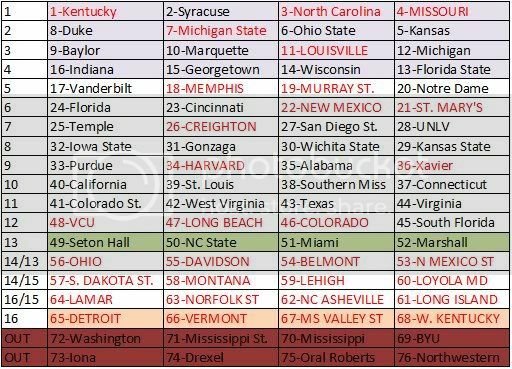 The next three teams, Colorado State, West Virginia, and Texas, I would place at around 80%. But past that, it's almost impossible to say. Virginia, NC State, and Miami all have similar resumes. The conundrum is that Virginia arguably has a better resume than NC State, who has a better resume than Miami, who has a better resume than Virginia. At the moment, I put all three in simply because I couldn't separate them. I included both Big East bubble teams, and at the last moment added Marshall. The Herd's pair of top-20 wins over Southern Miss in the past week, four overall top-50 wins, and bad losses that really aren't that bad got them in the field over BYU and Mississippi State. But that could change with a gust of wind.